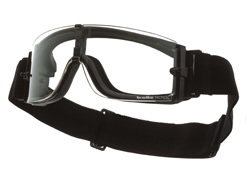 A really popular ballistic goggle due to their simplicity. At only 106g they are really lightweight and yet fully helmet compatible. The lens stands off the frame leaving a small gap to provide excellent ventilation. Along with special anti-fog lens treatments this makes them especially good in wet and humid environments or when performing especially rigorous activity. They are STANG certified to resist impacts up to 177m/s (637km/h) which is very high for ballistic eyewear but not as high as the x1000. If you require the highest possible resistance see the dual lens x1000. Each pair is provided with a separate microfibre pouch for cleaning and storage. 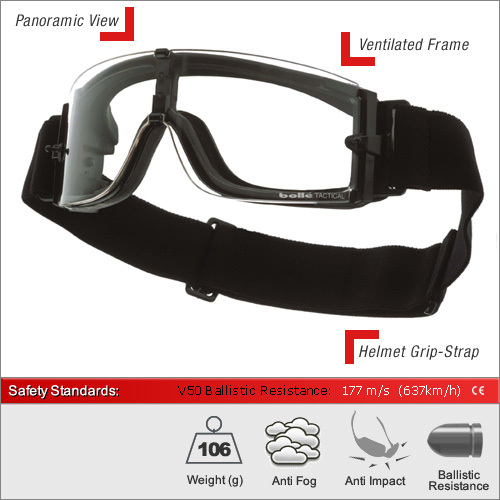 Here we have also summarised the main European safety standards for the frame and lens. After each are their specific safety markings (i.e. 2-1.2 1F). To interpret these and understand the full specifications of each pair, please see our dedicated Standards Advice Section.